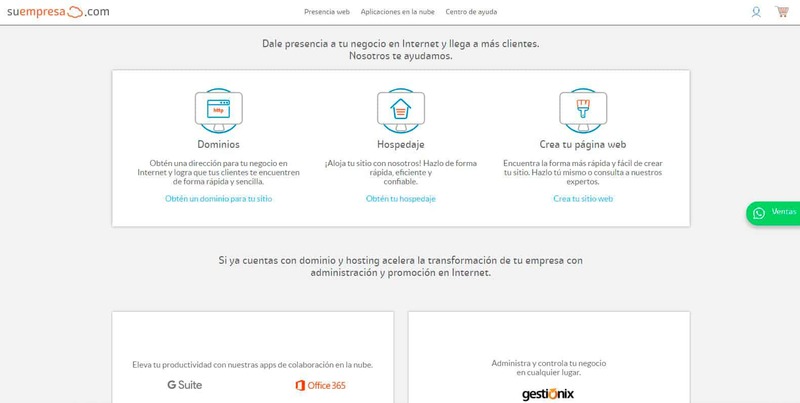 suempresa.com Review 2019: Is suempresa.com a Good Hosting? With over 15 years of web hosting and domain registration, Suempresa has been at the forefront in the digital transformation of new SMEs and companies in Mexico. They offer a range of hosting solutions, email marketing, and web design tools including storage. Suempresa is a subsidiary of the Wingu Networks, one of the largest Cloud hosting companies in Mexico. The firm provides web hosting and corporate email solutions along with domain registration services, mass storage, and website building tools. Traffic for the starter package is capped at 50GB while the two higher level plans are subject to fair use transfer. Your storage allowance is in the range of 10GB-30GB. If you intend to build or host a number of database-driven websites, I would advise you to upgrade from the starter to one of the other two plans. Both accounts can host between three to five websites and an unlimited number of MySQL databases. Looking at their Windows hosting plans, they mirror their Linux packages in terms of storage, traffic, and the email accounts that you’re allowed to create. The only exception is that you can create and host ASP or ASP.NET apps, unlike with Linux hosting. When signing up, you can order your hosting package along with a domain name, SSL, Office 365, G Suite, and Google Ads. Don’t worry about cyber-attacks as their servers are DDoS-protected. While they support open source and enterprise app installation, they’ve put a cap on the number of scripts you can install. Basic account holders can only install up to 20 apps at a time. When you upgrade, you will also be able to install more apps. Using their website builder (with a drag-and-drop interface), you can create a simple static website. Just choose the template you like from the 40+ mobile compatible designs available and customize it accordingly. You can add page sections, texts, images, and hyperlinks. If you get stuck, look at their FAQs and tutorials. They’re somewhat detailed and will guide you every step of the way. Being e-commerce ready, their hosting plans let you create a functional e-commerce store with a product catalog that includes photos, categories, and a shopping cart with secure payment processing. If you so wish, you can create seasonal offers and run promotions. Don’t worry if this is a gray area for you. They have a concise and easy-to-follow PDF guide to help you create, position, and promote your online store so that you can sell more. With pricing in Pesos, Suempresa offers a range of affordable hosting packages. You can sign up for monthly hosting plans with or without commitments, or go for the annual plans, which are 30% cheaper. When processing your payment, you’re supposed to make reference to the service you’re paying for otherwise they will assume that you don’t need an invoice. Though their pricing is within the market range, I don’t think their features are as rich in comparison with other prominent hosting services on the same level. They accept card payments, bank transfers, and in-store payments. It may be tempting to start from the bottom and work your way up, but if you can, go for the higher level plans. These come with more storage space and features, and you’ll be getting better value for your money. You can easily upgrade by paying the price difference between your current plan and the one you want for the contract period. It is important to note that their hosting packages include 16% VAT. When it comes to support, there are three viable channels of finding help. You can open a ticket, send an email, or call the customer support team from 8:00 a.m. to 9:00 p.m. on Monday through Sunday. I believe they will be able to answer your questions and resolve your hosting issues in good time. Though they don’t have dedicated servers or VPS, Suempresa offers stable hosting packages with impressive performance and localized support. Wondering how suempresa.com stacks up against other Web Hosting companies? Enter any other Web Hosting company and we will give you a side-by-side comparison.